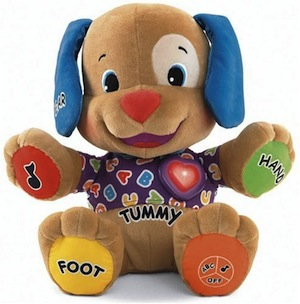 Play games, sing songs, enjoy lots of learning fun with this cuddly friend. Two interactive play modes introduce baby to A-B-Cs, 1-2-3's, colors, and parts of the body, plus sing-along fun with favorite songs and games, including Itsy-Bitsy Spider, Pat-a-Cake, This Little Puppy Went to Market, and more. Requires 3 AA (LR6 alkaline) 1,5V batteries. Helps baby learn through everyday experiences! Invites baby to learn through singing, dancing & playing. Cuddly pal enhances baby's sense of security, inviting baby to hug & express friendship. Helps baby learn about parts of the body. Introduces baby to the alphabet, colors & counting. Helps baby understand connections between words & images.